Beat the Morning and Afternoon drop off & pick up! Beat the Morning and Afternoon drop off & pick up! The SMCHS School Bus is here! Check out our Transportation page for all bus routes. St. Monica Catholic High School announces hiring of head football coach. Welcome to St. Monica Catholic High School. Follow this link to set up your personalized one-on-one counselor meeting and to find out more ways to navigate your entrance to SMCHS! The St. Monica Performing Arts Department welcomes you to our spring production, "How to Succeed in Business Without Really Trying"! The musical opens this Friday with performances at 7pm on April 5, 6, 12 and 13, with a 2pm matinee on April 13. 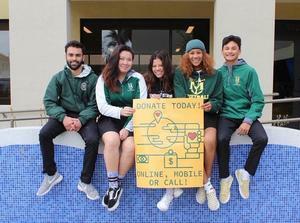 Today is our Day of Giving for the Annual Fund and we need your participation again this year. This Day of Giving is a way to culminate our Annual Fund, a final push to encourage parents to be partake in the successes of their school and support the great of our teachers and administration. In line with the school’s Mission and building on the rigorous college preparatory curriculum, SMCHS is offering a new opportunity for our students to thrive called the Academic Pathway Program (APP). Come cheer on this year's dancers Sarah Joyce, Michelle Liu, Jessica Clark, Barbara Sowa, Grant Conboy and Phil Dansart. With special performance by our Dancing with Our Stars Junior Student Ensemble. Don't Miss It! SMCHS celebrated its spring honors assembly on Tuesday, January 15, honoring students in the area of academics and citizenship. The speaker for this event was Dorene Dominguez, Chairwoman and CEO of the Vanir Group of Companies, one of the country’s largest real estate development and construction management firms. 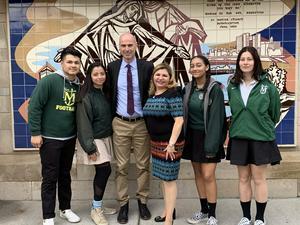 Ms. Dominguez is a part owner of the Sacramento Kings, a trustee of her alma mater, the University of Notre Dame, and sits on a number of corporate boards. Fortune magazine in 2017 named her one of America’s 50 most powerful Latinas. Ms. Dominguez spoke of the importance of "failing up, life-long learning, and valuing diversity."